Outdoor fall decorating is all about taking cues from nature’s harvest hues. But with so many rich colors and rustic styles, outdoor decor options can be overwhelming. We’re here to help you simplify and narrow your decor choices to create an autumn-inspired porch that welcomes -- and wows. From pumpkins and hay bales to wreaths and votives, we’ve found eye-catching ways to decorate your front porch for fall. Get inspired to decorate a fabulous fall front entry with these tips. If you favor bold yellows and burnt oranges, this look might be for you. Lots of gourds, heaps of hay, and maybe even a few scarecrows make your heart flutter. For a classic look, opt for classic wreaths adorned with fall leaves, pinecones, and acorns. If traditional feels boring, a hint of glamour may bring out your fall style. Go for gold by incorporating metals into your front porch decor. Play with paint and experiment with adding style to gourds -- think gold dots or stripes on a Lumina (white) pumpkin. Add drama by painting just the stem. A little sparkle will be up your decor alley, too. Think vintage apple crates, repurposed pallets, and burlap bunting. This look is a little bit country with a hint of vintage charm. Resonate with rustic? Play with neutrals and textures. Think greetings on chalkboards, mums in mason jars, and layered pieces of barn wood. Fall decor should be a complement -- not a distraction -- to the exterior of your home. If your front door is maroon, using red as an accent in your front porch decor may not be a great idea. When plotting your fall front porch, consider your home’s exterior paint colors and architectural style. These will clue you into what colors and textures to decorate with. For example: If your home features lots of brick, you may want to pick white pumpkins for contrast. 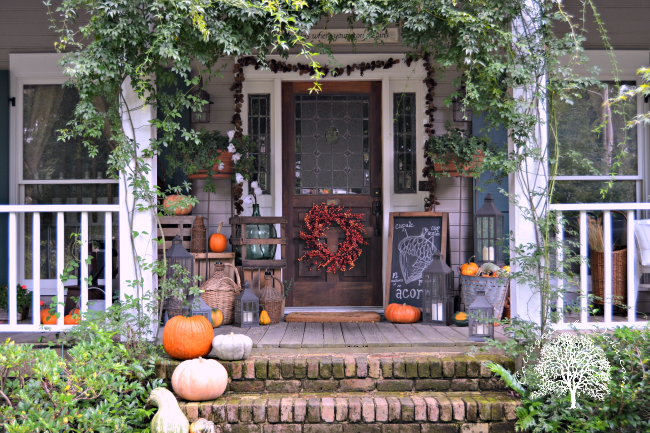 No matter your style, it’s certainly possible to decorate your front porch for fall for minimal cost. A little planning before you dream up your decor helps you create -- and stick to -- a budget. For budget-friendly decor, use nature! Sticks and twigs bound with twine can be charming and cost just pennies. Fill jars with leaves or acorns, and group together pumpkins in a cascading style on your stairs for instant wow-factor. (Check sales at grocery stores for affordable pumpkins and gourds.) Tea lights and votives add drama and interest at night, for minimal cost.